"I admit I was excessive and emotional and inebriated. Mix those together. But the focus of my tweets remains intact. I stand by that." Edwards admitted it was a mistake to mention Ruiz and Patterson. His brother, Berkley Edwards, is a running back on the team and Edwards said he plans to reach out to both players through his brother. “I apologize for that,” Edwards said. “I’m a man. We make mistakes. I’m sorry. I should not have gone that way. I still agree with the overall message – what do we do now (as a program)? But I apologize – shouldn’t name individual players. They’re still kids. That’s what I apologize for. Those aren’t bad comments from Edwards, and really, they’re recognition of what his role as an analyst should be. Calling Ruiz “weak” and Patterson “scared” was inappropriate, and while it’s certainly possible to criticize individual players, that can be done without such loaded insults. It’s more debatable if his comment that Michigan is “trash” is appropriate or not; going after the program as a whole for a shoddy performance is certainly fair, but there are probably still better ways for someone paid for his analysis to say that. (Even if he was making these particular remarks on his Twitter account rather than on camera, he should know any criticism he unloads on Michigan is going to get traction, and he should have been a bit smarter about how he criticized them.) And hey, if inebriation is going to make you tweet things you’ll regret, maybe put down the phone. However, it’s also refreshing to see Edwards not back down from his comments criticizing the program, even after taking backlash from Harbaugh and punishment from BTN over what he said. 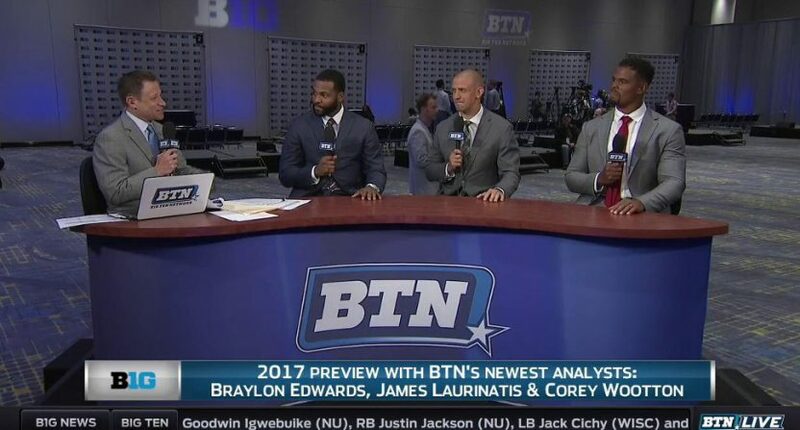 A common tendency in media is for alums of a particular school or professional team working as analysts to still view themselves as part of that program and offer nothing but support, and that’s a disservice to viewers. We also too frequently see people back off from fair criticism when there’s some pushback from the subject, and Edwards isn’t doing that. Now, he can still be better in future; there are smarter ways to criticize both individual players and programs as a whole, pointing out particular things they’re doing wrong instead of just lobbing insults like “trash” and “scared,” and hopefully Edwards will do more of that down the road. But it is nice to see him sticking by his critical guns even after all this backlash.